Novi Sad is the second largest city in Serbia. Beautifully situated on the right shore of passing the Danube, Novi Sad is often called the city of falling bridges. The reason for this nickname is that in only 100 years the bridges over the Danube were destroyed over 11 times. Leaving that to the side and concentrating on Novi Sad, you can not help but note that this Serbian town has a distinctly European atmosphere. This is mainly due to the beautiful architecture, tranquil lifestyle of their locals and introverted attitude towards everything and everyone around them. Novi Sad is the main location of the northern Serbian province of Vojvodina. The second-largest city in Serbia has a population of about 300 000 people, and with suburbs that number rises to 400 000. One out of two bridges built along the Novi Sad over the Danube, leads directly to the village of Petrovaradin, which is the main suburb of the city. The etymology of the name of the town comes from the Latin word "Neoplanta". This is the name given by Empress Maria Theresa to the settlement in the 18th century. Literally translated, Novi Sad means "New plants". Novi Sad officially begins as a town in 1694 and almost instantly emerged as the main center of Serbian culture. This earned it the nickname Serbian Athens. In the 18th and 19th century, Novi Sad is the largest city which is inhabited by ethnic Serbs. Particularly severe period of Novi Sad was experienced during the war in Kosovo in 1999, when NATO bombing destroyed all three bridges across the Danube, leaving the city without communications, water and electricity. Today, Novi Sad is a large industrial and financial center, mainly for the Serbian economy. The city is constantly growing and is considered the largest construction zone in Serbia. 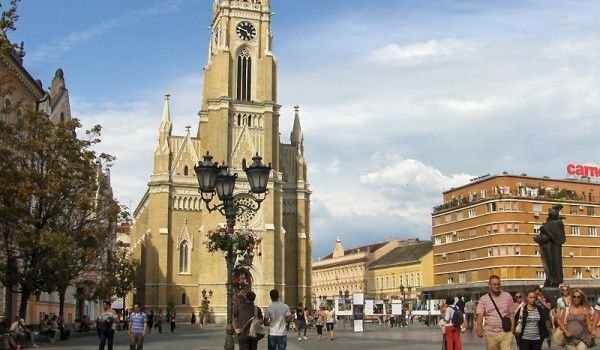 The central part of Novi Sad is marked by the large square, which has the town hall and central to it superb cathedral. Along the main central square crosses a street, named Vojvodina. The Great Cathedral of Our Lady Catholic Church is actually a marked Gothic architecture. 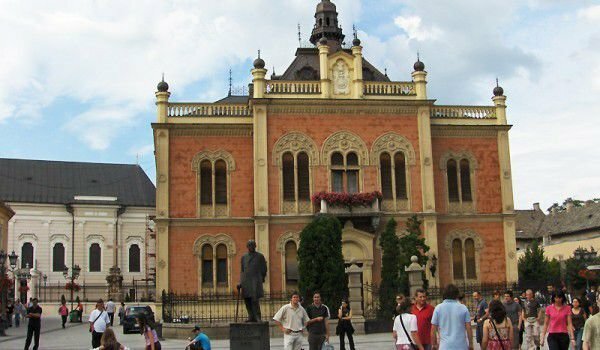 Among other attractions of Novi Sad is the Orthodox Church of St. George, the synagogue, the old castle, the Museum of Vojvodina and the collection of foreign art. Along Novi Sad is located Fruska Gora National Park, which the Serbs themselves called Athos. Once there was a complex of 35 monasteries built between the 15th and 18th centuries. Today have survived only 16 Orthodox monasteries. The largest historical landmark of Novi Sad is Petrovaradin Fortress. This is a huge palace complex built on a hill across Danube, which has a total area of 112 hectares. These dimensions and the history around the fortress in Novi Sad, make it one of the largest and most impressive fortresses in Eastern Europe. Petrovaradin was built in 1690 on the foundations of the old Roman fort. During the period 1754-1756 on the orders of Empress Maria Theresa, an extensive building campaign in the Petrovaradin fortress took place. After construction of the castle it is reinforced by new bastions and a clock tower. The fortress in Novi Sad was completed in 1760 and received the impressive nickname "Gibraltar of the Danube". Dungeons of the castle are occupied by impressive 16 km underground passages and tunnels. It is believed that some of them even lead to Novi Sad, which is on the opposite bank of the Danube. Each year the Petrovaradin fortress holds the July festival “EXIT”, which is one of the biggest musical events in Europe. Throughout the castle are spread over 25 stages, each of which hosts a different musical genre. The festival lasts 4 days and during the rest of the year around the premises of this fortress in Novi Sad are held various galleries and studios of local artists.